The Commonwealth of Kentucky isn't Hollywood, but you would have been hard-pressed to find a better screen play in Tinseltown than the one that played out at Rupp Arena on an emotional Senior Night. 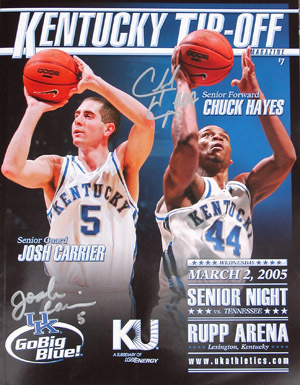 Kentucky said goodbye to two seniors who have played a lead role in the Cats unparalleled three-year run, leaving both players - Chuck Hayes and Josh Carrier � and 24,205 fans teary-eyed by the final credits. 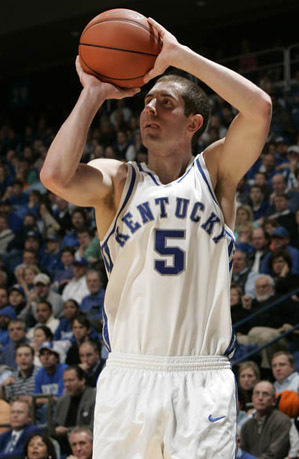 Hayes keyed a late 16-2 run and Carrier scored a career-high nine points in the Cats' 73-61 victory over Tennessee. "I was holding it in all I could," Carrier said of the overwhelming emotion. "If I had let one tear go, they all would have come out. They might come out now when I get back to the shower." It didn't take long for everyone in the house to see the storybook ending coming. Carrier swished a three-pointer from the corner less than two minutes into the game, his first points since Dec. 22. Carrier later added a second triple in the first half and another in the second to spark his career night. Joining Carrier's shooting party in the first half was another Kentucky native who showed four days time wasn't enough to cool him off. Patrick Sparks scored all 14 of his points in the first half, connecting on 4-of-5 from long range while staging a shooting duel with Tennessee's Chris Lofton. Despite the good vibes, UK found out the Volunteers weren't giving an inch, especially since Coach Buzz Peterson's future seemed to be hanging in the balance. The Vols took a 32-27 lead late in the half but watched UK score the final 10 points of the half to hold a tenuous five point edge at the break. The plot continued to thicken when a 16-4 Tennessee run in the second half tied the score at 55 with 8:24 remaining. Neither team could take control over the next few minutes, as both went scoreless for more than three minutes before a familiar face did what he seemingly has done his whole career. It was only fitting that Hayes converted a three-point play on his way to seven of UK's next 10 points and nine in the final 5:18. "It was a well-played out script," UK coach Tubby Smith said. "If you were writing a script on how the game would play out, it unfolded the right way. Chuck made those clutch plays down the stretch and we kept going to him and he kept delivering." 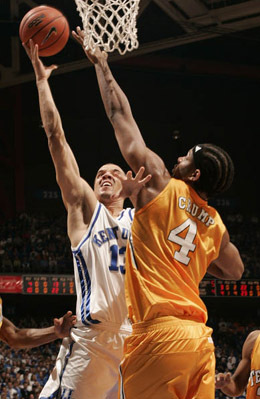 Tennessee did the same with Lofton, the Mason County native who had ventured into Rupp Arena many times for the Sweet 16. Lofton hit five of his first seven shots on the way to 13 points at the half, but he cooled considerably in the second when cramps plagued him, finishing with 19 points on 5-of-13 from long range. "(Lofton) has a huge heart," Peterson said. "He and Patrick Sparks going back and forth there on the threes, that's fun. We were in a zone and Sparks hit one from the 'Rupp Arena' sign (on the court). You can't do much about that." Tennessee couldn't do much with fate either. Not on this night. Not when two guys like Hayes and Carrier were saying goodbye. 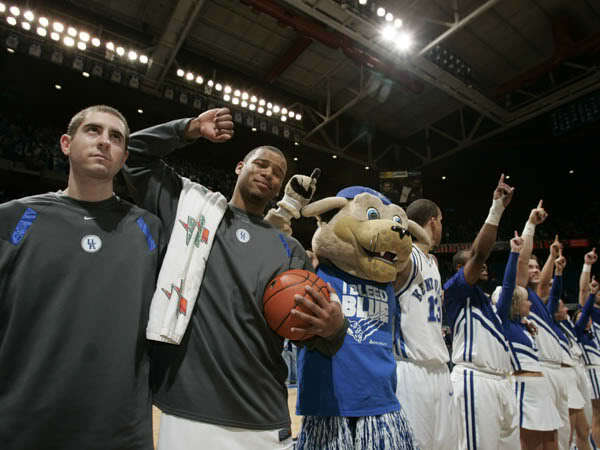 When the final buzzer sounded, Hayes and Carrier joined their teammates at midcourt for the playing of 'My Old Kentucky Home', arms raised high. Both ended up crying. Just like in the movies.